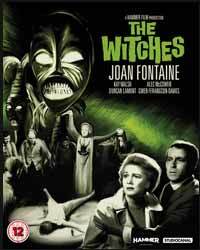 The Witches, released in 1966, is not so well known as many other Hammer films, but it has a good pedigree, with the screenplay having been written by Nigel Kneale of Quatermass fame, and based on the novel The Devil’s Own, by Peter Curtis. The main stars on display here include, Joan Fontaine, Kay Walsh and Alec McCowen; however, I was more intrigued with early appearances by Michele Dotrice (of Some Mothers Do 'Ave 'Em) and Leonard Rossiter (of Rising Damp). This is a quaint little tale, very much of its time, wherein even the villains are respectable, civilised and formal. The performances are fine, but in the major final scene is prolonged to the point that many of the actions look ridiculous. One moment the coven’s members are flailing their arms around like an embarrassing dad at a disco, then they are rolling around on the floor like a dog after a bath. I did like the sequence in which Gwen finds herself in a psychiatric convalescent home. It would have been nice if they could have extended and made more of the fact Gwen was playing the doctor at his own game – making him believe she remembered nothing, while secretly planning her escape. This is a movie well worth watching, without being one of Hammer’s better examples. However, there is a new documentary on the disc, called Hammer Glamour. I found it highly entertaining, as any Hammer historian, horror fan, and hot-blooded male probably would. There are clips and interviews with many notable lovelies, the most gorgeous of which is (in my opinion) The First Lady of Fantasy, Caroline Munro. Perhaps we will soon see a nice up-to-date Blu-ray edition of Captain Chronos: Vampire Hunter, in which she looks stunning.